In the wake of one of the wackiest seasons in the history of college football came a matchup of two of the greats in the National Championship. Great marching bands, that is. The 2007 NCAA football season embodied the spirit of the underdog. Top 10-ranked teams lost to unranked opponents left and right. The curse of being BCS No. two left countless teams wishing for what could have been. But out of it all emerged two top opponents and perennial powerhouses—the Ohio State University (OSU) Buckeyes and the Louisiana State University (LSU) Tigers. The Buckeyes returned to the national championship this year after a disappointing loss to Florida last year, and the Tigers weren’t far removed—they won the national championship game in 2003, splitting the title with USC. Last year they beat Notre Dame in the Sugar Bowl. This year’s National Championship game brought a great showdown of two dominant teams, but perhaps the better matchup came between the two universities’ marching bands. Both have won the coveted Sudler Trophy in past years (OSU in 1984, LSU in 2002). Both bands are more than a century old. And both can brag about their close ties to two top-tier football programs. But on Jan. 7, 2008, the two bands came together and played together alongside hundreds of high school musicians for a Sugar Bowl halftime tradition. When the Ohio State University Marching Band arrived in New Orleans on Saturday, Jan. 5, members had already attended the first two days of class for the winter quarter. In order to minimize the class time missed, the band practiced at night Wednesday through Friday at Ohio State’s indoor practice facility and left for New Orleans in the early morning on Saturday. After taking the rest of Saturday off to check out the French Quarter and do some sightseeing, band members got down to business on Sunday for their final practice before game day. “We have an interesting tradition at Ohio State where a lot of our alumni come to watch our last practice,” says Dr. Jon R. Woods, director of marching and athletic bands. “We wear our rehearsal clothes— not our uniforms—but matching grey sweats for practice. Several thousand alumni and supporters showed up to watch the rehearsal before the band headed over to the Ernest N. Morial Convention Center for a Buckeye football pep rally. The band then had the rest of the night off before game day, but it’s been no picnic getting back into playing shape for the Buckeye Marching Band. After five days of practice, the band departed from the hotel at 9 a.m. on Jan. 7 to begin the grueling game-day festivities. Throughout the day, the Buckeyes sent a small pep band to several events—the Fan Jam, where the Buckeyes faced off against a contingent of the LSU band, and two separate pregame parties—but the rest of the band remained focused on the game and the hour-and-a-half practice that each band is allotted in the Superdome before game time. The nation watched as the OSU Marching Band spelled out Script Ohio as the sousaphones ran across the field to dot the “i” for its traditional pregame show—this time performed during halftime because of pregame time constraints. For bowl games and away games, the band spells Script Ohio facing both directions. For the LSU Tiger Marching Band, traveling to the Superdome from Baton Rouge is like taking a trip into LSU’s own backyard. Only 80 miles from campus, the stadium is home to the New Orleans Saints as well as the annual Sugar Bowl—and this year, the BCS National Championship. The Golden Band from Tigerland, as the LSU band is often known, took a trip to the Superdome in its own home state for the second year in a row—this time with a national championship on the line. Although King is far from the only member of the band from New Orleans, the LSU Tiger Marching Band has a surprisingly geographically diverse membership. The band travels well, though. 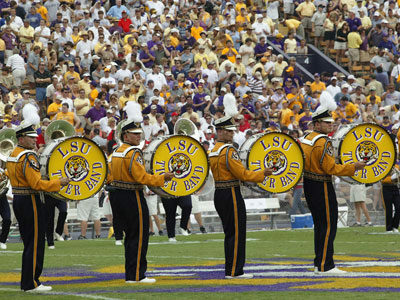 As a unit, the band sent at least a small pep band to each of the football team’s away games and the full band attended games against Ole Miss and Tulane University. Not surprisingly, with that kind of support, the LSU Tiger Marching Band had a very high percentage of its 325 members return for the National Championship game—and the fans and team appreciate it. ”Everyone is extremely excited at the opportunity to be playing in the national championship,” said trumpet section leader Robert Schinetzky a few weeks before the game. Eddie Carden is an editorial intern for Halftime Magazine. He is a junior, majoring in public relations and neuroscience. 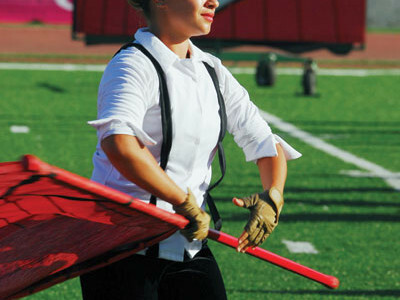 He has performed with the University of Southern California “Spirit of Troy” Marching Band as a trumpet player at back-to-back-to-back Rose Bowls. 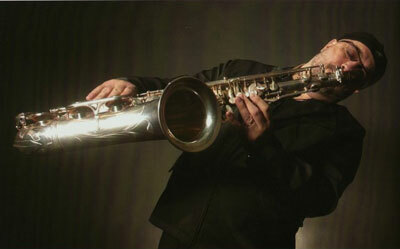 He also appeared in a State Farm commercial as part of a five-piece band. 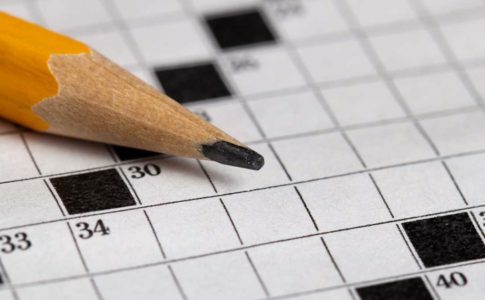 Crossword: “Marching Units”: How Do You Measure Up? A musical-themed crossword puzzle, created exclusively for Halftime Magazine. Here is the July/August 2012 crossword: "Marching Units": How Do You Measure Up?.